This is a review of a 3 way split album between Russia's Burnt, Astarium and Scolopendra Cingulata called "Gnosis Of Death" which was released in 2016 by Narcoleptica Productions and we will start off te review with Burnt a band that plays a very raw and keyboard form of black metal. Their side of the split starts out with ambient style keyboards and after the intro the music goes into a very fast and raw direction that also uses a great amount of blast beats and tremolo picking along with the vocals being mostly high pitched black metal screams. Keyboards also mix in with the heavier sections of the music at times along with the music being very heavily rooted in the mid 90's while the songs also bring in a great mixture of slow, mid paced and fast parts and melodies can also be heard in some of the guitar riffing and acoustic guitars are also used briefly. Burnt plays a style of black metal that goes back to the earlier days of the genre where they started mixing keyboards into the music while also capturning the raw feeling of those days which has been lost over the years, the production sounds very dark adn raw while the lyrics cover dark and depressive themes. In my opinion Burnt are a ery great sounding old school raw and atmospheric black metal band and if you are a fan of this musical genre, you should check out their side of the split. RECOMMENDED TRACKS INCLUDE "Dead People" and "Suicide". Next up is Astarium continuing his symphonic style of occult black metal. His side of te split starts out with ritualistic and demonic voices before adding in more of a symphonic style and you can also hear all of the musical instruments that are present on his side of the recording and on th second the music gets heavier while mixing the symphonic elements. During the faster sections of the songs both the tremolo picking and blast beats give the songs a more raw feeling while the vocals use both grim and high pitched black metal screams and the songs also bring in a great mixture of slow, mid paced and fast parts along with the riffs also using a decent amount of melody and a couple of the tracks are very long and epic in length and the solos and leads are done in a very melodic fashion. Astarium creates another recording that is also in the occult style of occult black metal, the production sounds very raw yet heavy at the same time while the lyrics cover darkness and occultism themes. In my opinion this is another great sounding recording from Astarium and if you are a fan of occult or symphonic black metal, yiou should check out their side of the split. 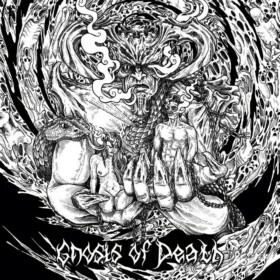 RECOMMENDED TRACK "Spirits Of The Dead". Closing the split is Scolopendra Cingulata another band that has been featured before in this zine and plays a raw form of black metal. Their side of the split starts out with spoken word samples before going into a more heavier and melodic musical direction where you can also hear all of the musical instruments that are present on their side of the recording and when the music speeds up a great amount of blast beats can be heard. Vocals are mostly grim black metal screams along with thee solos and leads adding in a melodic style and the tremolo picking gives the songs more of a raw and 90's second wave feeling and atmospheric keyboards can also be heard in the background briefly and the songs also bring in a great mixture of slow, mid paced and fast parts and their last track is very long and epic in length and in the instrumental ambient direction. On this recording Scolpendra Cingulata takes the raw black metal style and mixes in more keyboards to add something new to their music, the production sounds very dark and raw while the lyrics are written in Russian and cover history, war and literature themes. In my opinion this is another great sounding recording from Scolopendra Cingulata and if you are a fan of raw black metal, you should check out their side of the split. RECOMMENDED TRACK "Rassvett". In conclusion I feel this is a very great sounding split and would recommend it to all fans of Russian black metsl. 8 out of 10. «Иных грешников ад почему–то не принимал, и они мучились в каком–нибудь странном месте на земле, — быть может, для того, чтобы являться поучительным примером». Александр Амфитеатров. «Дьявол». Просто инфернальный триптих вышел недавно (в прошлом году). Завизированный в Хеллканцелярии. Наполненный зловещей энергетикой, сродни с той, что бывает вьется вокруг и особо ПОД гигантским крематорием. Здесь все живое скукоживается в кокон, а полумертвое расцветает как бодлеровские цветы, что бы он не имел в виду под этим эпитетом. Запасись гематогеном, слушатель. Говорят, его делают из бычьей крови. Откусывай по кусочку с начала каждой песТни (злобарьского мизантропического трака, внятно вам излагаю). Burnt - это проект неизвестного человека, который свои координаты не раскрывает. Nomina sunt odiosa (латинский) — «имена ненавистны (не стоит называть имен)». Ну и мы настаивать не стали при расспросах руководства лейбла Narcoleptica Productions. Тем более, что не в этом суть. 5 траков общей длительностью более 13 минут. Атмосфера номер 1 этого компакт-диска. Ныряем в серые пространства. Упадок и мрачные слои разложения, подчеркнутые параноидальными клавишами (которые сами по себе достаточно депрессивны). Далее начинается подпольный блэк, спродюсированный в лучших традициях эмбиентных коллективов LLN. Только здесь наличествуют специфические выхлесты звука, которые как обугленный нож вылетает из колонок и слушатель каждый раз отскакивает — если реакции хватает. Быстро и угрюмо, с вокалом, заточенным на стилистику застенков инквизиции, низкий блэковый - в стиле старой финской школы - ну в те антисвятые времена, когда жанр почковался от дэт-металла. Нередко композер просто бросается в эмбиент, клавишно и струнно возвещая металльной диаспоре о том, что что-то грядет. То ли метеорит, то ли комета, но обязательно черное и гибельное. Творец может настойчиво рубануть по самому жесткачу, прошибая лобные доли головного мозга сначала низкочастотным звуком, а потом ревом. И все-таки потом - эмбиентальный пейзаж, набросанный по мотивам сочинения «Как я побывал в аду, и почему меня оттуда выгнали». Это дальние пространства заброшенных, выгоревших и пыльных полей с плотным воздухом, полным саранчи. Однако и там можно продышаться, чтобы перейти к следующему исполнителю. Astarium, уже известный нам исполнитель - несколько откликов есть в моем хранилище манускриптов. Новосибирский проект с большим количеством записей, только полноформатов 6 штук. Знаем, что Astarium переменчив, многолик как гидра, которой сколько не отрубай пальцев), а они все отрастают и тянутся к клавишным. 4 трака - около 20 минут непреходящего мракобесия, залитого свинцом синтезаторного разлива.